I am an experimental biologist whose research interests are directed toward an understanding of the dynamic interactions between marine animals and their environment. In particular, my work focuses on the endogenous and exogenous factors that mediate the behavior and physiology of benthic, particle-feeding invertebrates. I take an integrative approach in my research program by studying processes ranging from the organism to ecosystem level. Much of my research focuses on commercially important species, or shellfish (e.g., clams, oysters, mussels, scallops). These animals exert great control over the particle supply and distribution in many coastal ecosystems, and can influence the biology and ecology of other organisms. Additionally, they provide vital ecosystem services, and are an important link between the oceans and human health. Because suspension feeders play such a key role in near-shore ecosystems, it is important to understand how they obtain and process food and non-food particles, what factors control feeding processes, and the effects of environmental perturbations on their overall health. For more information about my research laboratory, please visit my web page (see link to the left). Interactions Between Marine Aggregates and Benthic Suspension Feeders: Living and non-living particulate matter is ubiquitous in aquatic systems. Through physical, chemical and biological interactions, this particulate matter aggregates into larger particle masses (marine snow, flocs). During certain times of the year, >70% of suspended particles can be in an aggregate form, ranging in size from a few microns to more than a centimeter. Aggregation of particles has been recognized as an important mechanism for the transport of carbon, nutrients, and other materials to the benthos. Our work on the interaction of aggregates and suspension feeders can be divided into three areas of focus. Aggregates, TEP and benthic pelagic coupling – The traditional paradigm of benthic-pelagic coupling by suspension feeders involves the removal of phytoplankton and other particles from the water column, deposition of feces and pseudofeces to the bottom, and conversion of food material for animal production. Recently, we have described another possible mechanism by which suspension feeders can couple the benthic and pelagic realms. Through laboratory and field work, my students and I have demonstrated several key points regarding this proposed mechanism: 1) the pumping of water over feeding structures releases large quantities of transparent exopolymer particles (TEP); 2) the released TEP enhances particle aggregation and, consequently, deposition of material to the benthos; and 3) the aggregates and their constituent particles can be ingested. This cascade of events may represent an important but under-studied process that impacts water column processes and the fate of organic matter in near-shore waters. The ecological role of marine aggregates in linking pathogens to molluscan shellfish (an Oceans and Human Health Linkage) – In this study we are focusing on the role of aggregates as a link between pathogens (e.g., protistan & prokaryote) and bivalve shelllfish. Because aggregates are ubiquitous in the marine environment, benthic organisms (e.g., bivalves) are exposed to a steady supply of aggregates and the various microorganisms contained within. We hypothesize that marine aggregates enhance the transmission of shellfish diseases by at least two mechanisms: 1 ) as reservoirs when they serve to concentrate marine pathogens within their matrix; and 2) as vectors when they serve to enhance the capture efficiency of smaller pathogens (e.g., bacteria, zoospores) by the gills, thus increasing exposure to the bivalve host. This research is being conducted in collaboration with scientists at Old Dominion University, VA (F. Dobbs, M. Lyons), University of Minnesota (R. Hicks), and University of Georgia (J. Drake). 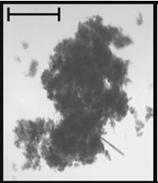 The aggregate pathway and enhanced uptake of nanomaterials (an Oceans and Human Health Linkage) – Manufactured nanoparticles and nanotubes are at the forefront of nanotechnology and are being used in a variety of applications including cosmetics, electronics, drug delivery, manufacturing technologies, molecular biology, and paints. Several types of nanoparticles have been shown to have toxic effects on terrestrial and aquatic organisms. The way in which nanoparticles are taken up by aquatic organisms, however, has been little studied. In this project, we are considering how feeding limitations of several bivalve species affect their uptake of nanoparticles, and determining how the form of delivery (freely suspended or incorporated in aggregates) mediates bioavailability, retention, and thus internal exposure. These results will allow us to probe the effects of nanoparticles on whole animal and cellular processes, and to develop biokinetic models of rates and processes for bivalves in the environment. This work is being conducted in collaboration with Rob Mason, another faculty member in the Department of Marine Sciences. Feeding Behavior and Physiology of Bivalve Molluscs: In this line of research, my students and I are addressing fundamental questions regarding suspension feeding mechanisms. We are studying bivalve species that possess different gill architectures, which translate to differences in the way in which particles are handled by the pallial organs. This research direction can be divided into two areas of focus. Elucidating particle selection mechanisms in bivalves – Using our previously developed techniques of feeding physiology and biochemistry, we are examining the bases of selection at the cell and organ level. This work allows us to address long-standing questions regarding the mechanism(s) by which bivalves and other suspension feeders accomplish particle selection. Our work focuses on the most plausible mechanisms involved in the selection process, and includes: a) manipulating particle surfaces to determine if selection is a function of surface properties (charge, wettability, stickiness); and b) investigating whether lectins in gill and labial-palp mucus bind to carbohydrate residues of the extracellular matrix of phytoplankton to mediate selection. This study is being conducted in collaboration with Sandra Shumway, another faculty member in the Department of Marine Sciences, and scientists at Stony Brook University, NY (E. Pales Espinosa, B. Allam). Functional mechanisms of control in the bivalve pump – In this study we are applying Particle Image Velocimetry (PIV) to investigate the physiological bases of water pumping and particle feeding in bivalves. Experiments are designed to determine relationships between pumping pressure and rate (volume flux), investigate mechanisms by which bivalves alter pumping activity, test the hypothesis that bivalve pumping activity is mediated by exogenous factors, and examine the variation in pumping behavior and performance among several bivalve species. Our research has the potential to resolve some of the long standing controversies regarding the physiological basis of water processing in bivalves. This study is being conducted in collaboration with Sandra Shumway, another faculty member in the Department of Marine Sciences, and scientists at the University of Louisiana (L. Deaton). For more information about my research laboratory, please visit my web page. For information on the I-RICH initiative, please visit this page. Rosa, M., J.E. Ward, B.A. Holohan, S.E. Shumway & G.H. Wikfors, 2016. Physicochemical surface properties of microalgae and their combined effects on particle selection by suspension-feeding bivalve molluscs. J. Exp. Mar. Biol. Ecol. [in press]. Kramer, A.M., J.E. Ward, F.C. Dobbs, M.L. Pierce & J.M. Drake, 2016. The contribution of marine aggregate-associated bacteria to the accumulation of pathogenic bacteria in oysters: an agent-based model. Ecol. Evol. [in press]. Pierce, M.L., J.E. Ward, B.A. Holohan, X. Zhao & R.E. Hicks, 2016. The influence of site and season on the gut and pallial fluid microbial communities of the eastern oyster, Crassostrea virginica (Gmelin): community-level physiological profiling and genetic structure. Hydrobiologia, 765: 97-113. Doyle, J.J., J.E. Ward & R. Mason, 2016. Exposure of bivalve shellfish to titania nanoparticles under an environmental-spill scenario: Encounter, ingestion, and egestion. J. Mar. Biol. Assoc., UK. 96: 137-149. Rosa, M., J.E. Ward, M. Ouvard, B.A. Holohan, E. Pales Espinosa, S.E. Shumway & B. Allam, 2015. Examining the physiological plasticity of particle capture by the blue mussel, Mytilus edulis (L.): confounding factors and potential artifacts with studies utilizing natural seston. J. Exp. Mar. Biol. Ecol. 473: 207–217. Doyle, J.J., J.E. Ward & R. Mason, 2015. An examination of the ingestion, bioaccumulation, and depuration of titanium dioxide nanoparticles by the blue mussel (Mytilus edulis) and the eastern oyster (Crassostrea virginica). Mar. Environ. Res., 110: 45-52. Ortiz, V., R.P. Mason & J.E. Ward, 2015. An examination of the factors influencing mercury and methylmercury particulate distributions, methylation and demethylation rates in laboratory-generated marine snow. Mar. Chem. 177: 753–762. Frank, D.M., L. Deaton, S.E. Shumway, B.A. Holohan & J.E. Ward, 2015. Modulation of pumping rate by two species of marine bivalve molluscs in response to neurotransmitters: comparison of in vitro and in vivo results. Comp. Biochem. Physiol., Part A. 185: 150–158. Doyle, J.J., V. Palumbo, B.D. Huey & J.E. Ward, 2014. Behavior of titanium dioxide nanoparticles in three aqueous media samples: Agglomeration and implications for benthic deposition. Water, Air, & Soil Pollution, 225: 2106. Shumway, S.E., J.E. Ward, E. Heupel, B.A. Holohan, J. Heupel, T. Heupel & D.K. Padilla, 2014. Observations of feeding in the common Atlantic slippersnail Crepidula fornicata L., with special reference to the “mucus net.” J. Shellfish Res. 33: 1–13. Pierce, M.L., J.E. Ward & F.C. Dobbs, 2014. False positives in Biolog EcoPlatesTM and MT2 MicroPlatesTM caused by calcium. J. Microbiolog. Meth. 97: 20–24. Rosa, M., J.E. Ward, S.E. Shumway, G.H. Wikfors, E. Pales‑Espinosa & B. Allam, 2013. Effects of particle surface properties on feeding selectivity in the eastern oyster Crassostrea virginica and the blue mussel Mytilus edulis. J. Exp. Mar. Biol. Ecol. 446: 320-327. Wall, C.C., C.J. Gobler, B.J. Peterson & J.E. Ward, 2013. Contrasting growth patterns of suspension‑feeding molluscs (Mercenaria mercenaria, Crassostrea virginica, Argopecten irradians, Crepidula fornicata) across a eutrophication gradient in the Peconic Estuary, NY, USA. Estuaries & Coasts, 36, 1274‑1291. Allam, B., W.E. Carden, J.E. Ward, G. Ralph, S. Winnicki & E. Pales Espinosa, 2013. Early host‑pathogen interactions in marine bivalves: Evidence that the alveolate parasite Perkinsus marinus infects through the oyster mantle during rejection of pseudofeces. J. Invert. Path., 113: 26-34. Cranford, P.J., J.E. Ward and S. Shumway, 2011. Bivalve filter feeding: variability and limits of the aquaculture biofilter. In: S.E. Shumway (ed. ), Shellfish Aquaculture and the Environment, John Wiley & Sons Publ., 81-124. Robbins, H.M., V.M. Bricelj & J.E. Ward, 2010. In vivo effects of brown tide on the feeding function of the gill of the northern quahog Mercenaria mercenaria (Bivalvia: Veneridae). Biol. Bull. 219: 61‑71. Pales Espinosa, E., D. Hassan, J.E. Ward, S.E. Shumway & B. Allam, 2010. Role of epicellular molecules in the selection of particles by the blue mussel, Mytilus edulis. Biol. Bull., 219: 50-60. Lyons, M. M., J. E. Ward, H. Gaff, R. Hicks, J. Drake & F.C. Dobbs, 2010. Theory of island biogeography on a microscopic scale: Are organic aggregates islands for aquatic pathogens? Aquatic Microbial Ecology, 60: 1–13. Pales Espinosa, E., M. Perrigault, J.E. Ward, S.E. Shumway & B. Allam, 2010. Microalgal cell surface carbohydrates as recognition sites for particle sorting in suspension‑feeding bivalves. Biol. Bull. 218: 75–86. Pales Espinosa, E., M. Perrigault, J.E. Ward, S.E. Shumway & B. Allam, 2009. Lectins associated with the feeding organs of the oyster Crassostrea virginica can mediate particle selection. Biol. Bull., 217: 130–141. Mafra, L.L. Jr., V.M. Bricelj & J.E. Ward, 2009. Mechanisms contributing to low domoic acid uptake by oysters feeding on Pseudo‑nitzschia cells. II. Selective rejection. Aquatic Biol., 6: 213–226. Meseck, S.L., J.H. Alix, G.H. Wikfors & J.E. Ward, 2009. Differences in the soluble, residual phosphate concentrations at which coastal phytoplankton species up‑regulate alkaline‑phosphatase expression, as measured by flow‑cytometric detection of ELF‑97 fluorescence. Estuaries & Coasts, 32: 1195‑1204. Ward, J.E. & D.J. Kach, 2009. Marine aggregates facilitate ingestion of nanoparticles by suspension‑feeding bivalves. Mar. Env. Res., 68: 137–142. MacDonald, B.A. & J.E. Ward, 2009. Feeding activity of scallops and mussels measured simultaneously in the field: Repeated measures sampling and implications for modelling. J. Exp. Mar. Biol. Ecol. 371: 42–50. Li, B., J.E. Ward & B.A. Holohan, 2008. Effect of transparent exopolymer particles (TEP) from marine suspension feeders on particle aggregation. Mar. Ecol. Prog. Ser. 357: 67–77. Frank, D.M., J.E. Ward, S.E. Shumway, C. Gray & B.A. Holohan, 2008. Application of particle image velocimetry to the study of suspension feeding in marine invertebrates. Mar. Fresh. Behav. Physiol. 41: 1-18. Kach, D.J. & J.E. Ward, 2008. The role of marine aggregates in the ingestion of picoplankton‑size particles by suspension‑feeding molluscs. Mar. Biol. 153: 797‑805. Lyons, M.M., Y.T. Lau, W.E. Carden, J.E. Ward, S.B. Roberts, R.S. Smolowitz, J. Vallino & B. Allam, 2008. Characteristics of marine aggregates in shallow‑water ecosystems: Implications for disease ecology. EcoHealth. 4: 406-420. Frank, D.M., J.F. Hamilton, J.E. Ward & S.E. Shumway, 2007. A fiber optic sensor for high resolution measurement and continuous monitoring of valve gape in bivalve molluscs. J. Shellfish Res. 26: 575-580. Lyons, M.M., R. Smolowitz, M. Gomez‑Chiarri & J.E. Ward, 2007. Epizootiology of Quahog Parasite X (QPX) disease in hard clams Mercenaria mercenaria. J. Shellfish Res. 26: 371-381. Heinonen, K.B., J.E. Ward & B.A. Holohan, 2007. Production of transparent exopolymer particles (TEP) by benthic suspension feeders in coastal systems. J. Exp. Mar. Biol. Ecol. 341: 184-195.